First, you can still submit your entry to the challenge and have it added to the Review. Today the reviews do not have any comments. I’m testing the different format to see how it goes. It was easier somewhat but still took four efforts to complete. But I see that as a blessing for what this challenge has become. As for the image below. Now you know what was inside of the wrapped up almost flower bud looking image last week. 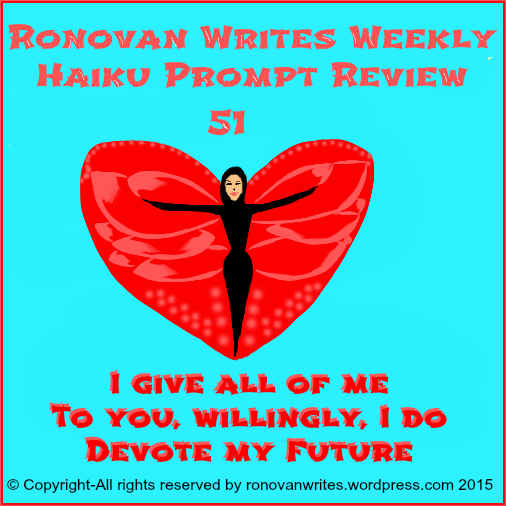 Week #51 Haiku Challenge Review of the Words Future & Give. Aimer Boyz of AimerBoyz: “I like dessert better than real food. I like fiction and happy endings and ice cream. I have no interest in sports, none. To me, Super Bowl Sunday means an empty shopping mall, yeah! I always meant to learn how to sail, and fly a plane, an d dance the waltz properly but nope, never happened. All cars should be convertibles and groceries should buy themselves!”~From the About Page. The Haiku: To Be Me. 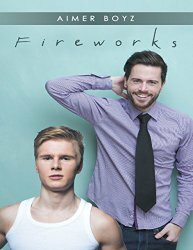 Aimer is also an author with the first book being GoodReads M/M Romance Member’s Choice Award Nominee 2014 Best Book Debut for Fireworks. Our very own Hugh Roberts gave it a 5 Star review. You can read his review on Lit World Interviews where he is a Team Member by clicking here. Steven Walsky of Simplicity Lane: Notes on a summer day. Check out and get Simplicity Lane free, go here for where you can get it. Through a Stranger’s Eyes here and Résumé for Love for free here. Olga of Stuff and what if…: Alterations. Melissa Barker-Simpson of Melissa Barker-Simpson (Author): Sacrifice. Melissa is an author of numerous books so make sure to visit her Author Page on Amazon here. Clarence Holm of PrairieChat: Springtime Blossoms. Sandra of Wild Daffodil: Letters. Combined with the photo challenge hosted on Blue Daisyz. She also has an Etsy Shop here. Sue Vincent from Daily Echo: Bridal. Sue is one of our resident authors with a LOT of books on Amazon. Click here to check them out. @SCVincent But Check out her NEW BOOK. Available in Paperback and for Kindle. Dr. KO of KO Rural Mad As Hell Blog: Future loss. Swatiu of imgrowing: Clean Slate. Claudette of to search and to find happiness in every day: Recycle. Becky G of Becky G? Oh, That’s Me! : Firm Hope. Colleen of Silver Threading: An Ode to Novel Writing. @ColleenChesebro Also remember to drop by the LWI site and read Colleen’s Book Reviews and Interviews with Indie Authors. She is excellent. Click here to see everything she’s written. Canaf of Faithful Devotionals: The Future. Angie Lin of Muddied Thoughts: No Cake for You. ← My Declaration of Independence from . . . Thanks for adding my haiku to your review, Ronovan. It’s a interesting challenge; two little words can bring up surprising feelings. I seem to be missing. Thanks for all your work on the challenges. Not sure how I missed yours this week but I added it last night as soon as I saw your message. My apologies. Thanks so much for the round-up and adding the links. Looking forward to this week’s words.